Hi everyone, I’m Yağız Kart. I feel deeply honoured to be deemed worthy of a part in this wonderful event in this very school where I met the vast world of MUN. Having finished a year of LP, I’m currently a freshman in Koç School and also an Ekin alumnus. I’ve been attending MUN events since the age of 12 and even thinking of the beginning of my MUN experience is enough to put a wide grin in my face. I’m going to be completely honest with you all, I had burst in tears the very moment I left the committee in the first conference I attended. 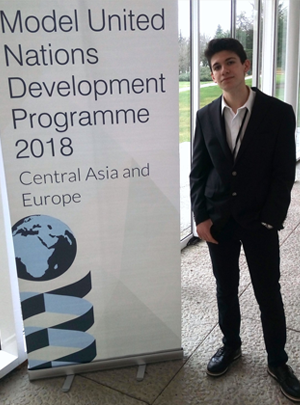 I didn’t have the slightest idea of what was happening with all these people in their elegant clothing, but trying gained me nothing but better results in every work I do and now here I am today sharing the great honour of participating EKIN JMUN with great people having notable achievements. Apathy is nearly in every aspect of our lives and MUN is the greatest environment one can be to break that! Broadening your world view and the way you perceive things around you, MUN is going to transform you into a politically conscious individual who’s never afraid to speak up. Along with the countless social opportunities it offers, MUN is also going to make you capable of getting into heated discussions with your peers, which is an admirable merit. I’m assuring you that every single second you’ll spend in MUN is going to be worthy of it. It is my most sincere wish that EKIN JMUN will be a great experience for us all.